Stinky odor and dangerous skin infections are caused by baseball equipment that hasn’t been treated and disinfected. 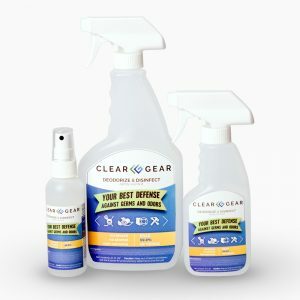 Clear Gear Spray keeps baseball gear odor and bacteria free. Umpire and catchers’ masks, pads, protectors and shin guards. 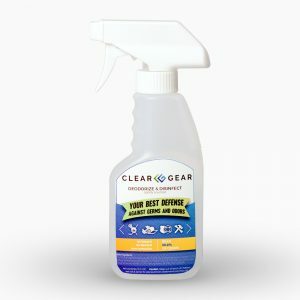 Spray Clear Gear on the inside and outside surfaces of baseball gear and equipment. Batting helmets and umpire and catchers’ masks: Spray liberally inside the helmet or mask, with special attention to the forehead area and chin straps. Remove inserts to allow to air dry. Be sure to also spray the crown of the helmet and in the crevices to prohibit the growth of mold, mildew, and odor-causing bacteria. Pads and protectors: Spray liberally on both the porous underside of the pads and protectors as well as the hard caps. Gloves: Spray the outside of gloves thoroughly to eliminate odor, bacteria, and fungus. Bats: Spray the entire surface of the bat and handle with Clear Gear Spray, with special attention to the grip. Allow to air dry before using again. 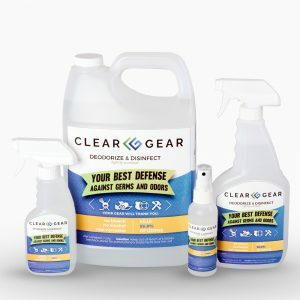 Note: Baseball gear and equipment that has never been disinfected or deodorized and is very odorous may need several treatments with Clear Gear Spray to reduce odors. 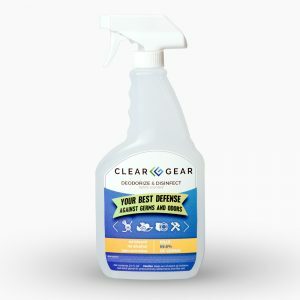 Use Clear Gear Spray from the start with new gear and equipment to prevent bacteria and odors.